Weather is getting warmer and sunnier and is setting the mood for BBQs! Best way to finish off a good BBQ is with a light, fruity and refreshing dessert. 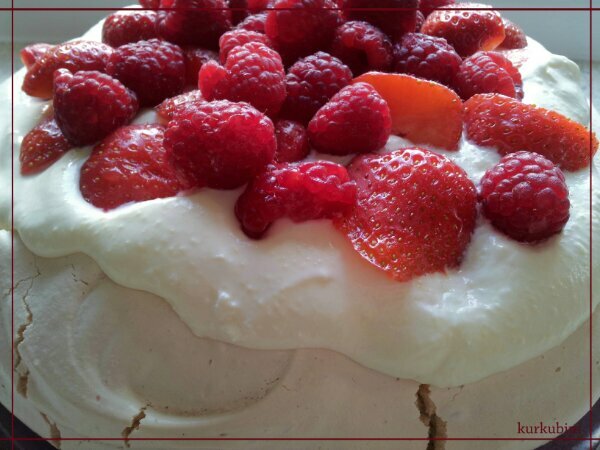 Pavlova not only tastes good but with all the berries and strawberries looks like a summer basket on your table. I always thought that pavlova is a Russian dessert but my friend told me yesterday that it’s indeed named after a Russian ballet dancer but was first made in Australia and New Zealand after the dancer’s tour there. I looked into many recipes and adapted them to make it as light and natural I could. Hint: The only issue for me was that the meringue broke. It is normal but if I had decided on the dessert long before I could have avoided it. The trick is to separate and leave the egg whites in the fridge for two or three days before you make the dessert. We preheat the oven at 150°. Beat the egg whites on high speed until they become a fluffy and full of volume meringue. We turn the mixer down to medium speed and we start adding the salt and little by little the sugar. When it is all in we turn the mixer up on high speed, we add the vanilla essence and we continue beating for 5-6 minutes and until the meringue becomes glossy. Be careful to not let the meringue loose its volume and get all flat. We spoon half of the meringue on a baking tray that we have covered with baking paper and form a round circle of about 3 fingers tall. Repeat the process for the other half on a separate baking tray. Keeping in mind that the meringue will rise and expand we can adjust the extent to which we spread according to the serving plate we want to use. Bake for 1 hour and until it has risen and is slightly golden. When we remove it from the oven we make the creme. Beat the double cream on a high speed and when it becomes thick add the yogurt. Keep beating and add the sugar and vanilla essence. When it is well combined the cream is ready. We wash the fruit and cut 1/4 in halves and quarters. Placing one of the meringues on the serving plate we spoon 1/3 of the cream and add the halves and quarters of the fruit. We place the second meringue on top and pour the remaining cream. Decorate with the remaining whole fruit and enjoy!